Here're the videos of the "Lohengrin" performance broadcasted by ORF III (hint: there might be some ad. from the video site before playing). Men of the Sinfonierchor Dresden e.V. We are just passing out the video we have found online for your reference. We didn't upload the video and we own no right to it. 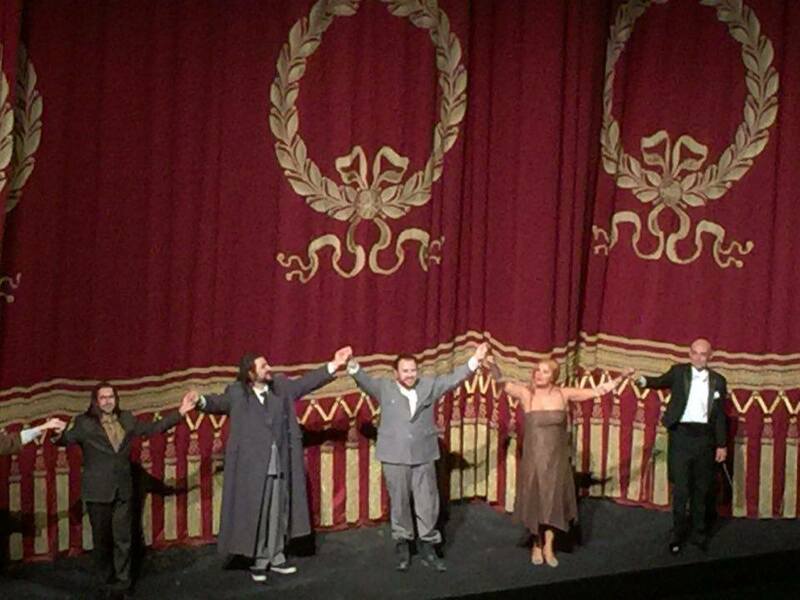 Last time I heard La Netrebko sing the Lady Macbeth, it was at the MET in October 2014. Back then, she had already improved from her role debuts at Bayerische Staatsoper (July 2014). More than 2 years later, I did not really know what to expect as she came back to the role directly after long runs of the demanding role of Manon Lescaut, which is not an easy one for the voice and where difficulties lie elsewhere. And… La Splendida was here with Verdi. Don’t ask me how it is possible, but while being larger and heavier, the voice seems more flexible in the coloratura parts. The opening aria is a killer (as the whole role actually). Right after reading the letter, the lady, who is sometimes not completely warm yet, is supposed to impress immediately and hit a high C in a huge cadenza. Then she has to sing the heavy Vieni t’affretta (which needs, strong middle and low register, while having to reach another high C at the end). That went as it was easier than last time. Authority singing, incredible projection with a beautiful line and flexibility. When the king was announced to sleep at Macbeth’s. Anna repeated the « Qui » of « Duncano sarà qui » in a soft but scaring way (you don’t want to be King Duncano here), then throwing a « QUI LA NOTTE » making the ceiling blow. That is being possessed by the music and the story. She then sang (easily) both verses of the cabaletta with different colors or intentions in each, making it her own. At the premiere, she went on singing all the final lines of the cabaletta (which are often cut) to end on an easy high note. Then her Macbeth (Franco Vassallo) arrived and they made a convincing pair. I have to say that in this staging, you almost have a bit of pity for the Macbeth couple. They love each other and have to face the loss of their babies, which makes the Lady’s awful ambition comes actually as a poor substitute for motherhood. At this point they behave like children when seeing a butterfly and they kill him by accident when trying to catch it, making them sorry, which comes as a sad symbol. When the chorus discovers the murder of the King, Verdi as wroten a huge ensemble. Anna’s voice was soaring like crazy above the chorus, making an incredible effect. In second act, La luce langue was delivered with all colors needed and attention to the text. But even more amazing was the brindisi. Which requires agility, many many killer trills, high notes and projection. Many soprano cheat here, especially with the trills. Not Anna. All was there, the voice was a bit lightened to manage this incredible stuff but you cannot hear it sung like this that often. Then again she soared above the chorus with incredible ease. After brief duet with Macbeth, the Lady has another and last big time with the sleepwalking scene. That was the point were La Splendida makes you definitely stop breathing. She catches you and doesn’t let you go till the end. The attention to the text, the search for meaning in the music, of appropriate atmosphere (which Verdi creates touch by touch here) and colors was astonishing. Sometimes she made the voice pale and almost colorless, childish, to show the Lady inner weakness, but then she did not hesitate to add dark, almost evil sound to make the evil side come out as obvious (chi mori). Some people would quibble of Anna singing Lady Macbeth as she has one of the most beautiful voice ever when Verdi wanted an ugly voice for the lady. But believe me: he would have agreed to this because it made real sense. The ugliness and the layers of the soul were revealed by the singing and not by the easy trick of a pure ugly voice. The final bars were incredible floating sounds filling the hall (don’t know how she does this), finishing with the awaited high B flat piano. I needed some seconds to recover and like all people I began to scream Brava! 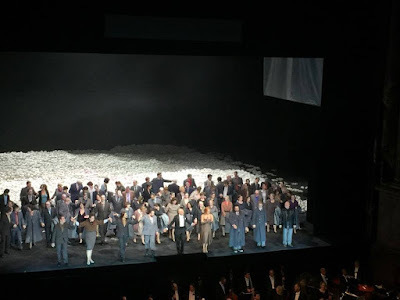 You can add a very good cast (especially Macbeth and Macduff) to complete the evening, a visually powerful staging (even if it cannot be the taste of everybody) and it was my best Macbeth! Such a luck to hear this amazing piece sung like this. Link to Bayerische Staatsoper website for more pics and some videos from Macbeth. Don't hesitate to share your own impression on La Splendida's performances (or other related events)! Email mystory@lasplendidanetrebko.com and we will post the interesting ones here in the blog! The works of this site are licensed under a Creative Commons Attribution-NonCommercial-NoDerivatives 4.0 International License.